Five years after legislators formed the State Board of Corrections to oversee the state's 15 county jails, the board flounders under the weight of muddled authority and unrealized funding promises from the state. When the legislators formed the State Board of Corrections in 2008 to oversee the state’s 15 county jails, they hoped a consolidated jail system could be run more efficiently and provide more programs aimed at decreasing the number of inmates. But five years later most of those goals remain only partially realized as the board flounders under the weight of muddled authority and unrealized funding promises from the state. Some county jail officials are now loudly objecting to the lack of funding and turning away inmates in protest. Compounding the problem is a lack of coherent data about Maine’s jails and its inmates that would help explain whether the consolidated system is working. For example, the Kennebec Journal attempted to obtain data on inmate reoffense rates at Maine’s county jails — called recidivism — but the Board of Corrections said that data is not collected. Jail population data, as well as budgetary information, are also hamstrung by unclear reporting from the county jails, making comparisons over recent years difficult. The task has proved nearly unworkable for board members. County sheriffs and county jail administrators continue to view corrections through a narrow prism that considers only local needs, local budgets and local voters. County officials have resisted granting oversight of their jails to the Board of Corrections and enacting recommended changes. As a result, the system hasn’t been able to show it’s fulfilling the board’s statutory purpose of cutting costs and reducing jail populations and criminal reoffenses. Meanwhile, board members have been unable to spend time creating treatment programs or finding ways to save money — they’ve sprang from one funding crisis to the next. Board meetings are almost entirely consumed by doling out dwindling state money to jails that have been forced to cut staffing and have put off capital improvement projects just to keep their doors open. Chief among those is getting reliable information about Maine’s county jails, according to the June 2012 Technical Assistance Report for the Maine Board of Corrections, provided by the National Institute for Corrections through the U.S. Department of Justice. Until 2009 each jail was run independently by the sheriffs and administrators in the individual counties. Many jails struggled with overcrowding. In January 2005, a half-dozen inmates were released from the Kennebec County jail to alleviate overcrowding the same week that the population swelled to 204 inmates, or 53 more than the jail’s maximum capacity. Penobscot County Sheriff Glenn Ross said about the same time that his jail was exploring the possibility of opening a minimum security jail due to overcrowding. At the same time, rates for “boarders” — people arrested in one county but held in another because of jail space — were set by individual jail administrators without guidelines to regulate how much the receiving county could charge the sending counties to house its inmates. There was no cooperation between the counties to bundle contracts for commodities — heating oil, food and medicine — in hopes of reducing costs. That was the conviction of then-Gov. John Baldacci when he outlined plans for a consolidated system in 2007. At the time, 10 percent of the property taxes paid to the counties went to operating the jails, Baldacci said in a recent interview. It was important to reduce the property tax burden through coordination while improving communications and consistency among the jails, he said. “As time has evolved, those things remain consistent, but I think now you see we need all the county sheriffs to work cooperatively, and the state needs to meet its funding requirements,” Baldacci said. Funding has always been an issue, but Baldacci doesn’t necessarily see that as a roadblock to progress. Straining to make a budget will force the Board of Corrections to make the system more economical, and it will likely force county administrators to step out of their comfort zones, he said. Baldacci said he expected the board to experience growing pains as it adapted to its new role, but felt it was important to break the cycle of individualism that marked county jail operations. Baldacci said he expected the law would need to be tweaked. He now echoes the refrain from Board of Corrections members that legislators must give the board broader oversight over individual jails, including their budgets and programs. “Rather than going in 15 separate directions, I think it would make much more sense,” Baldacci said. After initially balking at Baldacci’s plan for the state to take control of the jails, the sheriffs and county officials came up with a plan that would leave control of each jail with the counties, but create the Board of Corrections to oversee operations. County sheriffs and administrators were part of that negotiating process. Dion, who was Cumberland County’s sheriff at the time and part of the negotiating team, said L.D.1, a state law that caps property taxes, was heavy on the minds of county officials. The legislation aimed to ensure property tax relief by capping the money raised by counties at 2008 levels, which totals $62.3 million. Lawmakers promised the state would make up the difference as the cost of corrections rose with contracted salary increases and increased costs for employee benefits, fuel, food and other commodities. Tausek said the state’s funding comes from two sources, the Community Corrections Act, which provides $5.6 million per year, and the State Board of Corrections Investment Fund. The investment fund grew from $4.2 million in 2011 to $7.2 million in 2012, according to Tausek, but fell to $6 million this year. State officials have said funding will remain $6 million in 2014. Staffing and benefits, which account for about 70 percent of the overall operating costs, rose from a total of $48.6 million in 2010 to $55.1 million in 2013. Commodities increased from $6.3 million in 2010 to $7.2 million in both 2011 and 2012, before falling to $7 million in 2013. Tausek said the reduction in commodities’ costs is due to the decision by a number of jails to push back payments into the new fiscal year. Each of the county sheriffs has agreed to submit a budget detailing the actual costs of running their jails in hopes of convincing lawmakers of the gravity of the current funding situation. Not all of those budgets have been submitted, Tausek said, but those that have show a dramatic disparity between actual costs and state funding. In Aroostook County, for example, commissioners have approved a flat budget of $3.1 million, which is $350,000 less than it will need in 2013 to keep up with contracted employee pay increases and bumps in commodities. In 2014, the disparity will jump to $472,000. Tausek expects similar cost overruns, or worse, at every jail in Maine. Some jails, like Kennebec County, have been forced to cut staffing even as inmate populations continue to swell. Kennebec County Sheriff Randall Liberty, who is also president of the Maine Sheriffs’ Association, said he must cut $460,000 from his 2014 budget in response to existing state funding. To achieve the cuts, Liberty will eliminate five corrections officers, which will put the jail below staffing levels mandated by the state Department of Corrections. “When you dip below that, who is responsible for the liabilities and risk?” Liberty said. Meanwhile, few programs aimed at reducing recidivism have begun and those that have are in constant jeopardy of being slashed from the budget. Westrum said Kennebec County’s Criminogenic Addiction & Recovery Academy, known as CARA, which addresses substance abuse and helps inmates transition back into society, should be a model replicated throughout the state. Instead, its funding has been cut. Kennebec County will continue to run the program at county expense, but the future of all such programs is in question even though they aim to prevent criminals from reoffending. Exacerbating the problem, the state has neglected to put money in the inverse funding account because of a lack of available funding. When the Board of Corrections was officially formed in 2008 there was a total of $100 million in county debt associated with jails statewide. The state declined to take over that debt, but it promised to add money into the inverse funding account to match, dollar for dollar, each county’s payment on that debt. The money in the account was to be used for future capital improvement projects at each of the jails. Westrum said the state has never put money in that account, and all but four of the state’s jails are between 30 and 150 years old. “Since the legislature has never funded it, every time there’s a new need we’re going into the operating fund to pay for those major infrastructure issues,” he said. While facility upgrades are delayed and staffing is scaled back, jail populations continue to increase. The combination is potentially perilous, said Sheriff Ross of Penobscot County. The Department of Corrections caps his jail’s population at 143 inmates. Ross said the jail has operated in excess of that cap more than 80 percent of the time over the past six months. The Penobscot County jail had an average in-house inmate population of 156.8 between May 2009 and May 2013. Jail administrators were responsible for an average of another 25 inmates boarded out to other jails, on pre-trial release, or at other facilities during that same time period. One day recently the facility had 182 inmates in house, another 54 boarded at other facilities, and 40 on pre-trial release. Ross, like other county officials, fears for the safety of his staff and inmates. He said there have been five suicide deaths at his jail since 2002 and another 80 attempts during that time. Tausek said he has asked the person who manages the risk pool for the county jails for data on inmate assaults on each other and on staff, on suicides and attempted suicides, and on workplace injury. Without the numbers it is impossible to determine the impact of overcrowding on safety. He said only Penobscot and Aroostook counties have exceeded their population cap over a significant period of time. Part of Baldacci’s push for consolidation was to alleviate overcrowding within the state prison system. Rather than send inmates out of state, Baldacci said, the hope was to save money by keeping inmates in-state at the county jails. 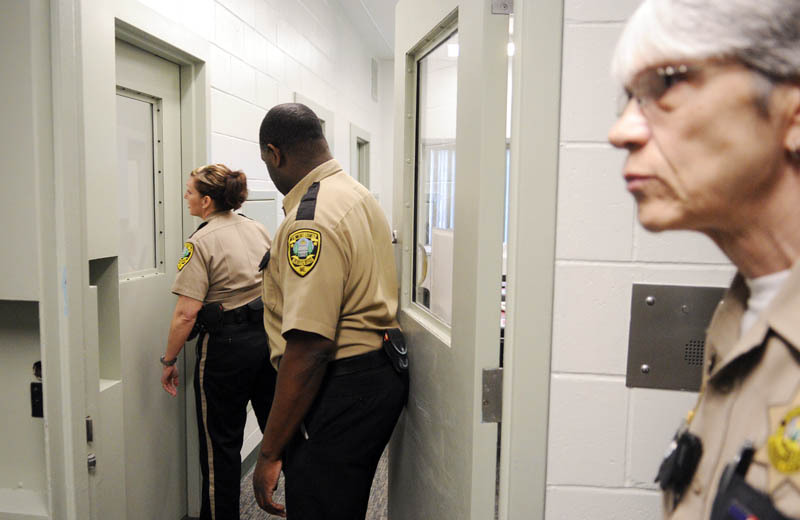 The state had an average of 119 inmates boarded at county jails in 2009. That number has fallen each year to a low average of 40 so far this year. The state will pay the Board of Corrections about $300,000 this year to house those inmates. Kennebec County also has struggled with overcrowding recently — one day last month it was 25 inmates over its cap, while Penobscot County was 40 over and Aroostook 35 over. The county started a pilot program aimed at reducing overcrowding. Individual jail administrators, seeking to board inmates elsewhere, have contacted administrators at each jail with a vacancy. Administrators at the receiving jails have to approve the transfer before it is completed, Liberty said. Often the administrators shop around for inmates who will cost the county the least to board. The new 90-day pilot program will establish a single controller who will coordinate movement from crowded jails to those with empty beds. Liberty hopes receiving jails will accept the controller’s decisions, but acknowledges that hope is based only on voluntary compliance. “With this pilot program we’re going to improve that efficiency,” he said. Liberty believes that there are enough beds in the system, but Ross is less optimistic. 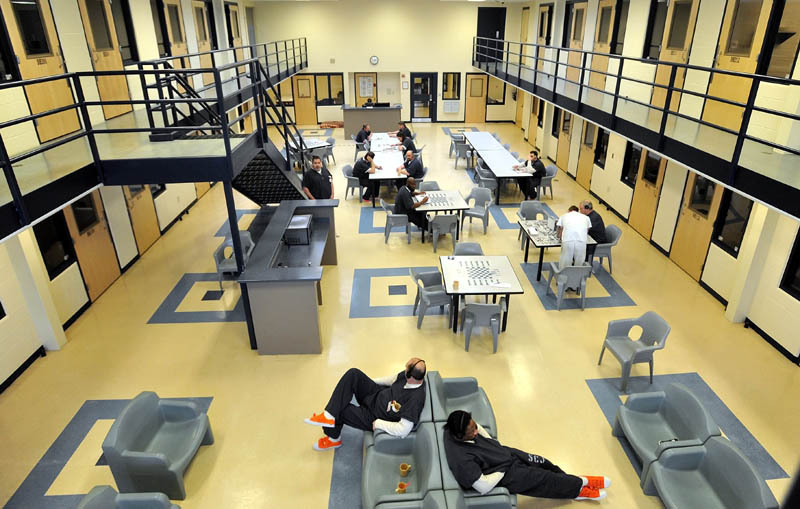 Somerset County’s decision to discontinue boarding inmates from other counties in response to the Board of Corrections’ withholding third and fourth quarter payments to the jail has thrown the overcrowding problem into the spotlight. Somerset County commissioners voted in January to take a portion of the $475,000 it receives each year from boarding federal inmates to pay down the $30 million debt associated with construction of a jail in East Madison that was completed in 2008. The board of corrections, which says using federal funding to pay down the debt is illegal, voted to withhold the third and fourth quarter payments to the jail. Roy disagrees. He believes there is nothing in the law that gives the corrections board control of the federal funds. Roy said state officials during the negotiation process refused to assume the county’s jail debt, but said the county could use the federal money for debt relief. Somerset County Commissioner Lynda Quinn echoed Roy’s recollection. Somerset County has recently filed a civil suit against the Board of Corrections seeking payment of more than $280,000. Westrum said the corrections board is committed to working with Somerset officials to address their concerns. The board has taken steps to save Somerset’s third-quarter payment until a resolution is reached. That resolution may well lead to the Legislature and a change in the law that would allow counties to spend federal inmate money to pay down their debt. For Roy, there is also deep regret. Within days of Baldacci’s announced plans in August 2007 to consolidate the county jail system and bring it under state control, Roy said the idea was “a bunch of gobbledygook” and threatened to halt construction of Somerset County’s $30 million jail. Roy now wishes he had taken further action on the misgivings he felt from the very beginning. “It was the worst decision we’ve ever made,” Roy said. State officials have told corrections board members not to expect additional funding, which means the board will have to be more efficient than ever, Westrum said. To meet the challenge, the board will need more authority to enact pre-trial diversions and post-conviction releases system wide to reduce jailing rates, Tausek said. The board also must have the clout to encourage individual jail administrators to make greater use of programs such as the drug court and veterans court to reduce incarceration and reoffense rates. The board must have the authority to bundle contracts that will benefit the system, even if it does not directly benefit an individual county. Tausek believes the board needs to evaluate each position within the jail system and hopes the board will contract with a property manager to create a priority list of capital improvement projects and help manage them. Liberty and Westrum were among a group that met recently with Gov. Paul LePage. The governor offered three possibilities: a complete state takeover of the jail system, a return to county control, or making the current system workable. LePage spokeswoman Adrienne Bennett did not return multiple calls seeking comment on details of the meeting. A return to county control would levy an additional $23 million on property owners across the state, including $1.5 million in Kennebec County, Westrum said. Dion said if the state takes over, there would be complications surrounding the state assuming control of county buildings and disparate labor contracts. 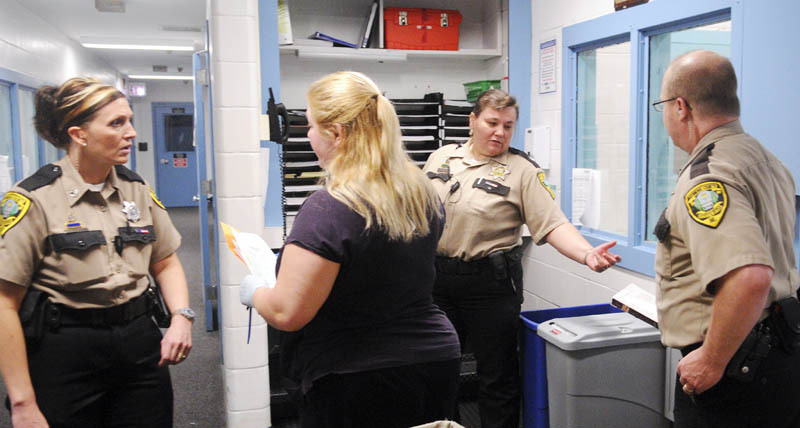 State corrections officers typically earn more than county officers. Westrum said a state takeover is unappealing on another level: The mission of state prisons, where most inmates are sentenced to lengthy terms, is different from jails, where 75 percent of the population is still awaiting trial. Westrum’s message to LePage was to give the Board of Corrections authority over jails it was created to oversee, or make the board disappear altogether. Dion, who was among the legislators to meet recently with corrections and county officials, said the creation of an experienced task force to identify the problems with the current system and develop suggestions to make it better would help bring the state closer to achieving its goal of standardizing how jails are run. That goal, which motivated Baldacci and legislators to push for consolidation five years ago, remains largely unmet, but those involved still believe it is attainable.